Every morning at Ape Action Africa’s Mefou Primate Sanctuary, caregivers check-in on all the residents to see how they’re getting on. And there are a lot of animals to check. The sanctuary cares for over 300 rescued animals. 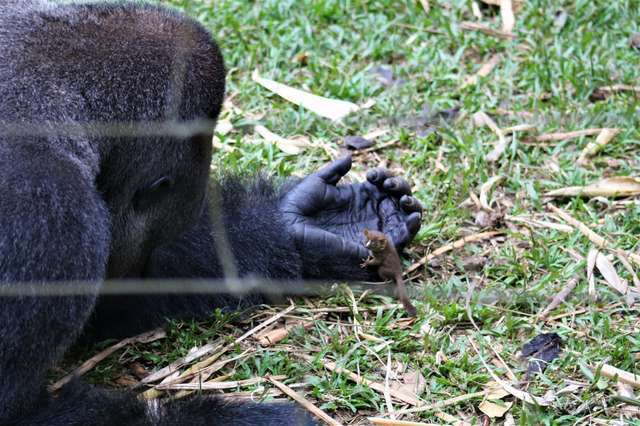 Earlier this month, the carers had gone to check on a group of gorillas, but one of them in particular, Bobo, had found something out of the ordinary. Bobo, a western lowland gorilla arrived at the sanctuary back in 1994 as a small 2-year-old gorilla toddler. Sadly, Bobo’s mother was killed by poachers and he was left vulnerable in the wild. 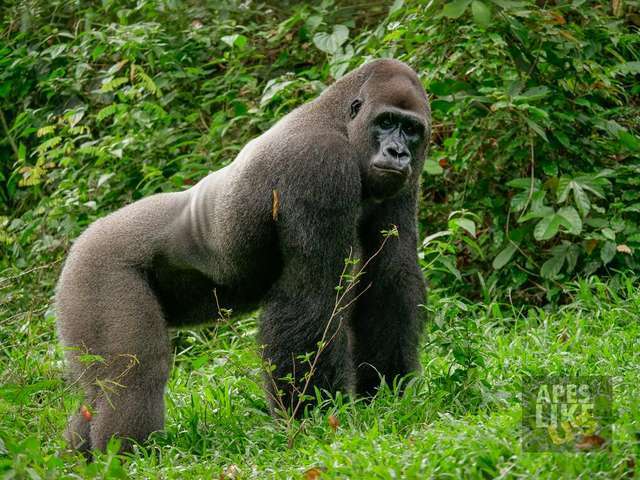 But now, over two decades later, Bobo is a strong, silverback gorilla and the leader of his pack at the sanctuary in Cameroon. But even though Bobo is the alpha male of his group, he’s secretly a gentle giant with a heart of gold. The carers at the sanctuary found Bobo had made a new friend in a tiny creature he found in the forest. They watched on as Bobo bonds with a bushbaby that he found. Cradling the creature in his hands, you can see Bobo wants to keep this adorable little creature safe and loved. 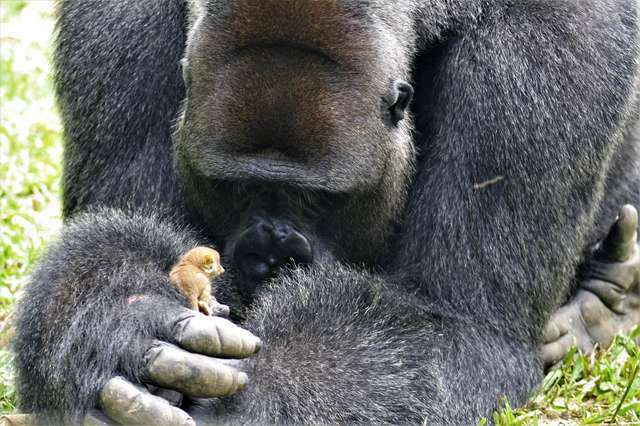 Our silverback gorilla Bobo made a surprising new friend this week — a wild bush baby! Caregivers discovered him cradling the tiny primate during their morning checks. They were amazed to see him handling it with the utmost care. The bush baby was most likely living somewhere inside the gorilla’s enclosure according to Elissa O’Sullivan, an Ape Action Africa spokesperson. The bush baby showed no fear of Bobo — moving around his body and spending time hopping around in an open grassy area, before choosing to return to Bobo. 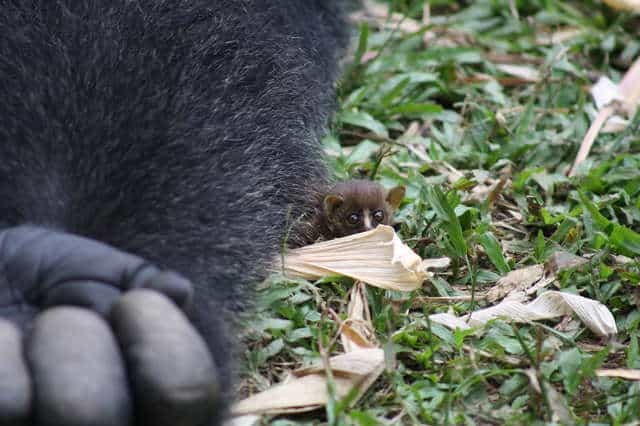 Watching as Bobo bonds with a bushbaby, the other gorillas became curious and they wanted to meet Bobo’s tiny friend. Bobo’s group-mates were desperately curious, particularly his favourite female Avishag. But he kept them all at a distance, making sure that no one disturbed his new friend. After almost 2 hours, Bobo was finished playing with his new pal. Bobo is a smart creature, he knew exactly where to take the bushbaby when he was done. When the game was over, Bobo walked purposefully off on two legs to deliver his friend safely back into the trees.